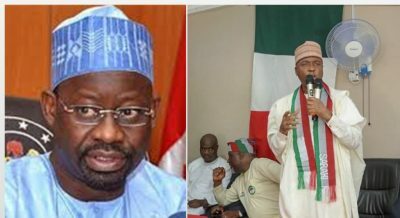 Governor of Gombe, Ibrahim Dankwambo has congratulated Atiku Abubakar for emerging as the flagbearer of the Peoples Democratic Party (PDP) for the 2019 presidential elections. Atiku polled 1,532 votes beating Aminu Tambuwal who scored 693 and Senate President, Bukola Saraki, who got 317 votes. Saraki’s statement reads, “Today is a great day for our party, PDP because it has shown what men and women of our party can do. Today has shown that the interest of our party and the Nigerian people is more important than our individual interests. “I want to thank Governor Okowa for planning and organising this transparent, free and fair Presidential Primary and Convention. “I congratulate our Presidential Candidate, Your Excellency, Alhaji Atiku Abubakar, for your victory. You have stayed on course over the years and truly, you deserve this victory.